Problem- When I try to enter a hyperlink in my article, the functionality works fine, but I have to know the URL to the article I want to link to, so I can manually enter the path in hyperlink. Is there any way I can browse existing articles using a dialog box of some sort? It would also be nice if I select an article using this browse menu that it would automatically put the article URL into my hyperlink. Solution - PHPKB 7.0 introduces a new and easier way to insert article links while creating or modifying your knowledge base articles. Links to other articles are created using a specific syntax, called "link marker". 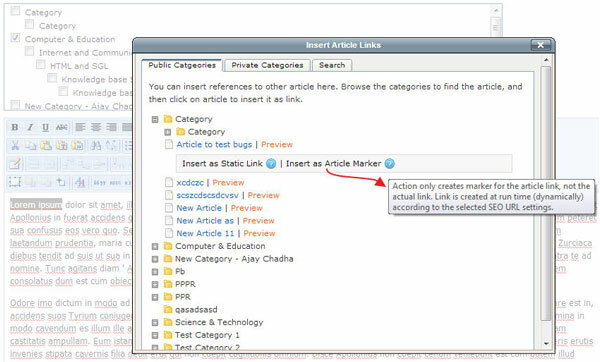 This not only helps in keeping links organized but also makes the link management between articles easy. There is a new button on the WYSIWYG HTML Article Editor that opens a dialog box (as shown below) to browse existing articles in your knowledge base. Let us suppose, "Article A" is linked within the content of "Article B", "Article C" and you try to delete Article A, the PHPKB software will not only warns you but also gives you the list of articles where there is a link to "Article A". You can then decide either to keep "Article A" in the system or delete it forcefully.